One of the common misconceptions about timber – and one that we get asked about quite a lot – is that softwood is an inferior product. Part of this misconception is simply because of the terms soft and hard. Obviously softwood can’t be as tough as hardwood, can it? Well, yes it can and that certainly applies to softwood timber decking. While some hardwoods are in fact extremely tough, some softwoods aren’t necessarily soft. In fact, some softwoods are tougher than some hardwoods. The difference between softwood and hardwood is not about toughness, it’s about plant reproduction, although in general hardwoods are denser and therefore tougher than softwoods. One of the key advantages of softwood, particularly for a project such as softwood timber decking, is that it’s usually cheaper than hardwood, so if you use softwood for your outside structures you’ll drive your budget further. The reason for the price difference is simply that softwood grows quicker than hardwood. So which timber should you choose? Is softwood timber decking the best choice? It really does come down to budget and personal choice. For example, an oiled hardwood deck looks magnificent and its natural variations and imperfections add character. 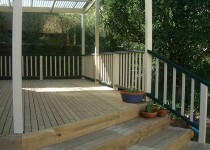 But softwood timber decking can also look great and can be stained if you wish to add colour or tone. Whether you choose softwood or hardwood, if you look after your timber you’ll have many years of trouble-free use to look forward to.